Relationships and community building allow you to survive the disruptive onslaught from Amazon and other massive retailers. Ted Rubin shares his insights on effective marketing and creating community to thrive and grow your business even in the face of market disruption. Discover the insights, tools, and workshopping you need to be a confident, enthusiastic, efficient, and effective executive leader. Leave with an updated Monday-ready action plan. Next event in Denver, January 19-20, 2018. Mark S A Smith: My guest today is Ted Rubin who is the author of Return On Relationship. He’s the co-founder of Prevailing Path, which we’ll dig into in the show, acting CMO of Brand Innovators. He is the most followed CMO on Twitter and recognized by all social media publications as a thought leader, and a must-follow, It’s All About Relationships. Welcome, Ted, to the show. Ted Rubin: Well, Mark, thanks so much for having me. I’m really excited to be here. I love the concept of what you do here, and I love the discussion about disruption, innovation and just really how do we make our way into the future with things changing so much faster than they change in the past. Mark S A Smith: Thank you, Ted. My model shows that a relationship is four times more important than the product when it comes to success in selling and specifically when we work with disruptive products. If our customers don’t trust us, they won’t even give us a shot. You’ve been working with online marketing, social media marketing to create relationships. How’d you get started with this? Ted Rubin: I’ve always been a relationship guy. The way I always looked and thought of myself was as a networker and a relationship-builder. What I didn’t realize until probably the last three or four or maybe five years, was that really, what I was doing was building communities. 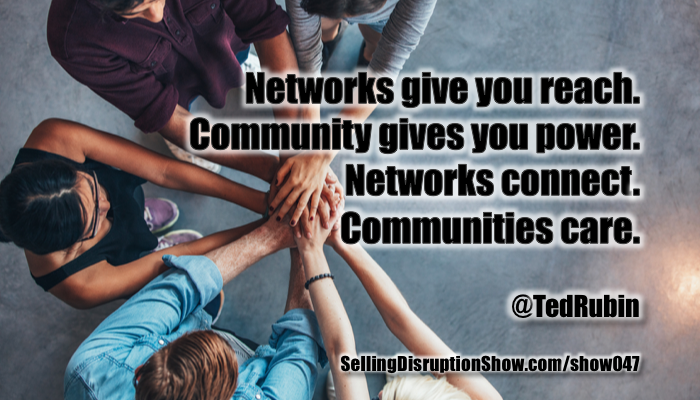 I like to say that a network gives you reach, but a community gives you power. Networks connect. Communities care. When you’re talking about the relationship aspect, when you network, it’s a one-to-one relationship, which don’t get me wrong, great value. It’s something I’ve been doing my whole life, but when you bring those people together to form communities is when I believe you set off that exponential factor in the relationship-building because it’s one person helping another, which leads to another person helping another, which gives you access into a whole other way of capabilities. When you look at LinkedIn, and you look at that concept where they show you were you’re connected and then, your friends are connected. When you imagine what happens when you bring all those people together, I’m talking to Mark, and Mark needs help with something. He’s not just reaching into his own network. He’s looking at other people that could potentially help them. Now, I’m going to jump ahead a little bit here just because I want to make sure to make this point. The problem is most people think it’s just about the line to the connection. They don’t understand how you have to work those things. I was at a conference that I was emceeing on Friday. Dana Randall who’s in charge of Innovation for Coach was talking about how important she has found her network to be in the communities she built in relation to innovation. The mistakes she sees people making and something her and I have talked about a lot is that we connect with people. Then, we don’t even reach out to them until we need them for something. Mark S A Smith: Yes, and there’s nothing in emotional bank account. Ted Rubin: No, there’s nothing there. It’s bad as when we initially reach out. Every conference I speak at, I implore people in the audience that when they connect with people via LinkedIn or how ever they do after an event, and okay, let’s admit it. LinkedIn has become the standard to the point where I’ll ask someone for their card. They’ll say, “Oh, no. I don’t carry a card. Just connect with me on LinkedIn.” I look at them and say, “You know, that’s a really bad idea because I am at this event. There’s 300 people here. How many are we meeting? Now, I have to remember not only your name but how to spell it to connect with you, whereas if you give me something as a reminder,” and then what happens people connect and all they do is go and click a button. Ted Rubin: Either they just do the connect button, or they include one of the standard LinkedIn, “I’d really like to be connected with you. We seem to know some of the same people.” I implore people to write a personal message. “Mark, it was really great meeting you at the Brand Innovators Summit last Friday.” Then, you might not have anything. You might have just met them quickly, but if you happen to have a conversation, try to throw in something like, “Oh, it was great hearing about the trip you took with your daughter. Please feel free to be in touch with me anytime.” Yes, a lot of my messages are very similar, but they’re all personalized. Granted, a lot of people don’t read those notes, but it’s not about the masses. It’s about the feel. I like to say that a brand is what a person or a business does. A reputation is what people remember and share. If you just make that mark on three or four of those 50 people you’re connecting with who say, “Wow, he wrote me a personal note,” it’s like the Doublemint commercial. Remember that? Mark S A Smith: I do, yes. Ted Rubin: I think you and I might come from the same generation. Mark S A Smith: We do. Ted Rubin: You have that. She knows two friends, and she knows two friends, and she knows two friends. People talk about that. To bring in another point is something I talk about a lot is that most people in social media never like your page, never make a comment, never even friends you. They just read your content, and they do what I call participate vicariously. I will tell you that I’ve been talking about this for years, but since I left the company that I helped found called Collective Bias, and I was out away from a place where people expected to see me, I can’t tell you how many people have come up to me at event after event. People I’ve never known follow me, telling me something like how much they loved the post I wrote or that trip I took for my daughter surfing and tell them your heart. This could be a CEO of a Fortune 500 company. He’s reading my stuff, but he’s not making a footprint because he doesn’t even necessarily want me to know he’s been there. These are the way you build relationships. You write a note after a conference personally, and even if only three of those people see it and respond, they go, “Wow, you know, no one’s ever written me a note like that.” Then, you have a quick little back and forth, and you used a perfect term. You started to build up that emotional bank account. Mark S A Smith: I think it’s really important to point out a couple things. You’ve covered a lot of ground really quickly there, Ted. As you always do, your content is always extraordinary. You’ve got lots and lots of articles. Your daily posts are really extraordinary. It’s how I connected with you with LinkedIn. I think there’s a couple things that’s important. One is if you tell somebody to connect with me on LinkedIn, and your name’s Mark Smith, you’re screwed, right? Mark S A Smith: Now, Ted Rubin even is a challenge. There’s, “How do I spell your last name?” The way that I fix that, of course, my link is prominent on my business card. I’ve created a short URL, so marksonlinkedin.com will take you directly to me. I try to make it easy, at least, if you’re going to do that. Second thing is your point about social media where people follow you. You might be followed by a CMO, and they don’t let you know. The reason why is because they found in the past, if they let people know that they follow them, those folks jump all over them, trying to sell them something. A lot of our community maybe vicarious until they need us the most. Ted Rubin: 100%. If you don’t write me a personal note on LinkedIn, there’s a good bet I’m not going to accept your request unless we already know each other. Maybe if you follow me on Twitter, and I recognize that, I might accept it because I am driving people from Twitter to LinkedIn, so I don’t want to be disingenuous by putting my link there. Then, they comment I don’t accept it. Mostly, if you don’t write me a note, I’m not going to accept it. Then, every once in a while, I’ll accept one from someone that writes me a note that I know is non-sense just because I always like to continue to prove it out to myself. I’ll see one, and it makes it look like it’s personalized. I know, nine out of 10 times, as soon as I accept that request with a note saying, “Hey, thanks for reaching out. Great to hear from you,” I know the next thing I’m getting is a sales is high. “We create websites for all people. We’ve reviewed your website,” and then, I automatically write back and say, “No, thank you. Not interested. By the way, I’m disconnecting,” because you’re using the old numbers game. The problem is it still works to a degree. People think it’s successful. What they forget to look at, and I tell this to companies who use retargeting tactics as well, is you only look at the upside. You don’t look at the downside. Mark S A Smith: Oh, that’s exactly right. Ted Rubin: You don’t look at what it’s doing to your reputation. Mark S A Smith: I’m going to disagree with you. Those techniques don’t work. People still believe that they do this. Folks that believe that, that works, but it really doesn’t, and the reason why is because it poisons their target market. As you point out, “I’m disconnected. You’re never getting back in. Sorry, friends.” If you get nasty, I’ll tell all of my friends to ignore these folks because they’re after the dollar, not the relationship. Those cold call type of strategies cause more problems than they create. Remember this. Buyers are liars. People come up with a reason, a rationale for saying, “I’m not interested in talking with you. It’s because you’re rude,” whether you are or not. This is a technique that needs to stop. Mark S A Smith: That’s exactly right. They poison the waters. Ted Rubin: You’re right, so I think you put it perfectly when you said you’re poisoning the well. Ted Rubin: You’re having this short-term, what looks like success, but what you’re doing is you’re making it harder for yourself going down the road. Mark S A Smith: Well, and what happens is those five people, those five accounts that you got, they had decided to buy, and they just hadn’t found a vendor yet. You just happened to fit the bill, which you ended up trading that short-term success for long-term failure. I see this all the time when I work with organizations that are still doing cold calling for high consideration products. That’s a massive mistake. A lot of people will argue with me, and I say, “Okay. Show me your long-term results.” All they can show me is short-term results. They cannot show me long-term results. Spot on, Ted. Why do you think retargeting has stopped working? Instead of saving that information for when I come back into the store or come back on the call or come back to the vendor, whatever it is, who can then immediately look at me and go, “Hey, I see last time, you bought this. Let me know how it worked for you. I want to know whether we’re helping you or we’re not.” Instead, all they’re doing is saying, “Let me sell them another one.” They’re not realizing the people that they’re turning off. I like to say all they’re looking at is the upside, the uptick, the up sale. They’re not looking at the people who are not going to do it in the future. It’s bombarding people. It’s gotten worse and worse because they’re confusing retargeting with contextual selling. I like to say I love Facebook ads. They’re one of the few ads I will ever click on as a consumer, not as a marketer curious to see where it takes me because when I’m writing to Mark a quick note about my upcoming hiking trip, and the fact that I might need new boots, Facebook is serving me an ad with boots that I might actually need. They’re not retargeting me. They’re actually properly contextually feeding me something, and they’re not throwing it into the middle of my feed. They’re putting it somewhere where it’s not hurting my social capabilities. Again, they’re not retargeting me. What I’ve noticed is Facebook is not hitting me with that same ad for the next six months, which almost everybody else is. Mark S A Smith: Oh, yes, yes, yes. We see that all the time. I already bought that. They’re not killing the cookies. That’s the problem. What if we took retargeting and did something better with it? The idea with retargeting is that old kinds of it takes multiple messages to move a person from apathy to purchase readiness. That’s been around for a very long time, proven over and over again, but what if we took that retargeting and turned it into, “Thanks for buying,” or is that just too creepy? Ted Rubin: No, I don’t think that’s creepy. What about if we took that retargeting and turned it into valuable content for the persons who do it. You just bought hiking boots. Why not give me some ultimate places to go hiking or some tips for preparing myself before I go on a hike? I’m a big believer in content. We’ve talked about that. You mentioned Prevailing Path in the beginning, and a lot of what Prevailing Path is about putting proper content in the proper place to build the relationship and to add value rather than to just sell something, because most people now are searching and actually finding their products via content. Mark S A Smith: That’s right. We’ve lost that, “How can I help,” which is the most powerful close on the planet. In context, it is the most powerful close. Ted Rubin: Laying it all out there, Prevailing Path, we’re still figuring it out. John Andrews is my business partner. John’s been a CPG guy his whole life. For those of you all listening who might not know the term, it’s consumer package goods. John worked at a number different companies. His last corporate job was at Walmart. He was originally in grocery marketing. One day, they tapped him on the shoulder back in 2007 and said, “How’d you like to be in charge of emerging media?” His next question was, “What’s that?” When they told him, which it was all new things that are not the normal way we’ve filled things in the past, mostly including content and social media. Remember, this was 2007. John immediate said, “Hey, that sounds really cool. I’d love to do that,” but then, in his own head, the alarm bells run off because you might not remember this, a lot of people don’t, but Walmart made some really tragic mistakes early on in social media. They were creating fake blogs. They had people that was supposedly bloggers that were actually employees. They did a lot of really crazy stuff, and as he said, he didn’t want to have his face in the New York Times in that manner. What john did, which I think is a good message to everybody in this audience, is he decided before he did anything, he was going to start listening. He was going to start putting out his fillers in this new social world and seeing what people were saying. What were the customers talking about? He very early on in the early days before people even knew what the term blogger, influencer was, he discovered the non-blogger community. All that they were writing, and they were also very directive mom bloggers who were money-saving mom bloggers, so very much in line with the Walmart brand. He started listening to them. This could be a whole podcast in itself, so I’m going to cut to the chase a little bit. He ended up founding and then bringing me in as a partner, a company that use bloggers to create content for brands in a story-telling format about products they actually loved. Our whole pitch to them was, “Don’t join this campaign if you don’t actually like this product.” We never sent them product. They have to go buy it. Now, we paid for it. We wanted them to go through the path to purchase. We wanted to say to them, “Okay, we’d like you to buy these new diapers.” They had to go Google or any way that they searched for it. We didn’t tell them to go to Google because maybe at that point, they weren’t, or to ask their friends to do whatever they did and to document it. Then, to go through and buy. I just did something with Leesa mattress. They didn’t send it to me. I bought it on their site because I wanted to see how simple was their process. Mark S A Smith: They return the money to you the moment UPS picks it up. Ted Rubin: Oh my God, how awesome is that? You don’t wait that three weeks for someone to get the product or whether for it to be there. Walmart is still waiting for that product to get to them before they give you your credit. Imagine who their customer is. Walmart’s customer is not a woman or a family that could afford to wait for that, for the most part. Mark S A Smith: To me, Ted, the most important aspect of that, Amazon giving me my money back when UPS shows us, is it shows they trust me. To me, that’s the biggest trust-building aspect of this. If they trust me, I’m going to trust them even more. Ted Rubin: All in all, we’re trying to get brands and retailers to understand what’s happening out there? We’re giving brands and retailers the ability, or we’re trying to, and I want to be clear about that. I can’t tell you that we have it down pat. We’re trying to give them the ability to measure digital shopping pathways to recognize active mid-funnel shoppers who are looking for content and create the medium that helps them do what they want to do because they are not clicking on banner ads anymore. They’re not finding things, like you said. You what the banner ad is? The banner ad is what you said about the cold call. It’s the guy that already decided to buy something and just wants to buy it now. It’s not someone that’s trying to figure out what they’re going to buy. Mark S A Smith: That’s right. That’s the difference between marketing and sales. Marketing triggers the conversation, sales, facilitates the transaction. I think what you’re doing with measuring digital buying pathways is extraordinary. First of all, it’s a moving target. It changes every day. Now, there are certainly some trends, but managing that customer journey in the digital world where there’s lots of noise, lots of activity, lots of options and helping facilitate to helping create a frictionless experience to that purchase is extraordinary. It’s one of the reasons why I like this conversation. How do you go about doing that? Mark S A Smith: I love it. That’s why I love that answer. Experiment and exploration are my favorite things to do. Ted Rubin: There’s so many bright people in these companies, and again, back to Dana Randall who I mentioned earlier from Coach, one of the conversations we were having, employees are just delivering on what they’re told to deliver on, mainly not because they don’t feel innovative but because it’s shut down on them. When they come up with an idea, they’re told, “That’s not how we do it here,” or “We’re not looking for you to reinvent the wheel.” Well, guess what? You should be looking how to reinvent the wheel because right now, who knows what’s happening? Companies like Nordstrom who are now opening up stores that are strictly experiential and have no product in it. They’re not closing down all their stores, but they’re opening up a certain percentage of these to figure it out. Kohl’s, I like to say what happened with Kohl’s and Amazon, my first initial reaction when I first saw Kohl’s opening Amazon stores within Coles was, number one, Band-Aid. Number two, they’re not even making the wolf blow the house down. They’re opening up the front door for the wolf. As I thought about it, they don’t really have a choice. That house is going down. Why not start experimenting now and see what you can do with it? I was on Chatter and I’m doing this retail segment on the Chatter network now. When we were on the phone on one of the calls, because we’ve been lately talking a lot about first, the Amazon wholefoods. Then, we were talking about what was happening with Coach and the way they’re alerting Wall Street that their sales are going to go down because they’re trying to figure it out. They don’t want to do what a lot of these brands and companies are doing, which is just discount their way out of a problem. Mark S A Smith: That’s not possible. Ted Rubin: This big announcement after the fact that they’re just getting destroyed is, “Oh, we’re going to be more promotional, and we’re going to discount more.” Oh, that’s just a race to the bottom. Mark S A Smith: That’s right. That’s an unsustainable business model. The reality is that if you don’t partner with Amazon in some way as a retailer, you are going to get killed. More than half of Americans have Amazon Fund. More than half of Americans have Amazon. 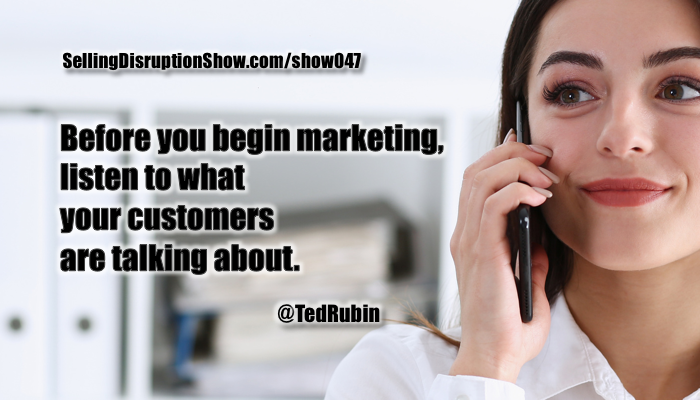 Ted Rubin: Start thinking about it. Start experimenting. A part of this call, one of the anchors on Chatter said to me, “Well, Ted, what’s the answer?” Of course, my first answer was, “If I had that, I wouldn’t be on your show. I’d be too busy in some board rooms, but if you want to hear what I’m feeling to do, they need to be experimenting even if it’s a mistake.” Start trying different things. Figure out how you’re taking the silos down. How are you connecting with consumers directly? How are you giving them what they need? How are you partnering with Amazon? How are you partnering with other brands? Can you compete with Amazon, or do you need to partner with Amazon? The only way to figure these things out is to start trying and not doing things as usual. My opinion is that wholefoods is training wheels for amazon. It’s their initial foray into owning retail stores. I think they’re going to buy a traditional grocer. I think they’re going to buy a discount chain because they want national footprint, whether it’s flying drones off the roof, for product being picked up or for simply getting into a market that others right now think are immune from them. Mark S A Smith: That’s right. One of the answers to this particular problem is what we started off with in our conversation here. It’s about building community. If you as a retailer want to survive, you have to build a community around your retail outlet. In some of the other shelves we’ve talked about, it’s going to tribes of people that are going to be selling to each other, and that’s the only way we can survive Amazon. Your thoughts? Ted Rubin: I’m really glad you brought that up because I’ve been saying this now for, I don’t know, four or five years, but I believe retail is coming full circle. Back when we were young, it was small businesses. It was the guy on the corner. It was the stationary store. It was a little grocer. They knew your mother. They knew your family. They knew when they said to your mom, “Hey, we’ve got this product. You should bring it home,” that if she didn’t like it, she wouldn’t be back in there and telling them. They didn’t just say it for anything. They made sure in their minds, it might actually be something she’d like. Then, your mass merchandisers came around. Everybody believed that retail became anonymous. Women started shopping in hair curlers. They could go places where they didn’t know anybody. They thought the brands didn’t know because they didn’t know the guy behind the counter. What they didn’t realize was that those brands for the last 50, 60 years have been tracking them. American Express has been collecting your data, Diners Club if you remember that, was collecting your data way back when, and they were already doing what they’re doing today, but we didn’t realize it. Now, we’re in this era where everybody knows they’re collecting our information, but it’s okay as long as we’re getting value for it. Now, what’s happened first step further, what I believe is happening right now, I believe that most of the mass merchandisers, Macy’s is dead, Walmart’s dead, Kmart’s dead, J. C. Penney’s dead, DIX is dead. Mark S A Smith: You haven’t even mentioned the longest retailer on the planet. They’re so dead, Sears. Ted Rubin: If I didn’t, I meant to. Here’s my point. When you drive by these malls, even the little smaller malls right on federal highway in Florida where I live, 90% of the real estate in that mall is taken up by those stores that are going to be shutting. Here’s what I believe is going to happen. Obviously, there are companies like Blackstone who just canceled the sale of their major mall properties in Australia because the prices were plummeting. They’re figuring out how to rework these malls to make it valuable. What I think is going to happen, and you’ll already see it in a lot of them, is they’re going to turn experiential. They’re going to turn food and entertainment, so a lot of these malls are almost becoming all restaurants, but I think the last leg back to my talk about retail coming full circle is that small business people are going to have access to real estate at much cheaper prices than they’ve had over the last 20 to 30 years. All these retailers that have been closing because what’s their biggest expense? Their storefront. They have to close because there are these major retailers willing to pay 10 times what they’re paying in rent. When this disappears, I believe the local retailer is going to have a new resurgence, but to your point, which I think is a great point is what’s going to make it work is they’re going to build community. They’re going to do experiences. They’re going to help people with their needs and wants. They’re going to be able to because their overhead is going to be so much lower than it was before, that they’ll actually going to be able to do what they wanted to do when they initially opened, which has truly become a part of the community and help people. They didn’t have time to before because if they didn’t get every last dollar of sales out of every square-foot, they ended up shutting down. Mark S A Smith: That’s right. That’s good news. You are confirming what I am hearing from other guests on the show. We are moving back to community-based marketing strategy. We’re moving back to community-based support. I love it. To me, the idea of having a community really enriches my life. Ted Rubin: Community is not just you and me talking. It’s a company that stands up for you. It’s a company that makes your life easier. It’s a company that makes you feel like they’re paying attention. I truly believe that even in the commodity field, it’s not a race to the bottom on price. It’s back to this simplicity. If you make her life simple, if you add value to her life, she will come back and buy from you again and again and again. Mark S A Smith: Another word that I like to use along with simplicity is frictionless. Let’s make this experience as frictionless as possible. Amazon does that with one-click selling. Uber does that with a click-and-away-we-go. Netflix does that. Most of the rapidly growing companies just provide that frictionless customer experience. It’s so powerful and so easy, so I’m with you. We’re speaking the same language, very powerful. Ted Rubin: Frictionless is a great term. I don’t know if you’re sure that this is just beginning to be a conversation, but people are talking about the possibility of Disney acquiring Netflix. Mark S A Smith: Wow, and why not? Ted Rubin: Yes. Disney is at a critical juncture. Their stock is going down. They’re having trouble staying connected with consumers, but they still have 150-billion-dollar valuation and an incredible product category, and they’re having a problem with who’s going to take over for Bob Iger. They don’t have a successor whereas Netflix has access to every consumer, has completed what you just mentioned. They have created the frictionless ability to connect with viewers, which Disney no longer has. They’ve got a CEO who’s young enough to take over Disney. Mark S A Smith: Netflix has more subscribers than all of the cable providers in the United States, and of course, it’s all digital. Disney wants access to that because they don’t have cable. They have ABC, but that’s limited reach. I think you’re right. That’s a brilliant move from a strategic standpoint. That’s a good call. Ted Rubin: It gives Netflix a very secure access to incredible content and incredible factory of content and expands their business, so who knows? What I can’t figure out, because I’m not a stock guy, is I don’t know which one of the stocks are worth buying. I own Disney right now, but all I’ve been doing is watching it go down, so who knows? Maybe out of hope, turn it around, or maybe that will just up Netflix’s stock. Who knows? Mark S A Smith: I suggest buying Netflix in that particular case, but I am not a stock guy either. On the other side of it, it also protects Netflix because Netflix is being gunned at by Amazon, Amazon Prime since half the United States has Prime and has access to the Amazon Prime Programming. Netflix is under the gun. Amazon won an Oscar this year. Mark S A Smith: There are interesting pressures in the marketplace, and I think Netflix joining Disney would really be powerful for all players involved. There we go. It’s about community, isn’t it? Ted Rubin: It is about community. Mark S A Smith: What’s next for you, Ted? Ted Rubin: Just continuing what I’m doing right now. As far as short-term next, John Andrews and I are working on a book called Retail Relevancy. We’re trying to put some of our thinking into a book format. I have been doing a segment on Chatter, which I’ve really been enjoying. It’s my first time doing a live, so unlike when you said to me, “Don’t worry. We can edit this. I’m going to clean this up,” you don’t get any clean up when you’re on a live network. Mark S A Smith: No, you’re not, no. Ted Rubin: I’ve really been enjoying that. It’s a new experience for me on a regular basis. I’ve done it once or twice before. Prevailing Path, we’re moving in a few different directions. We’re trying to figure some things out. We had made the decision that we don’t want to work with big brands. I’m done trying to convince a company to be doing what they should be doing. Mark S A Smith: Anybody who says, “We don’t do it that way,” is about to be disrupted. Ted Rubin: There’s so many barriers in these big brands. Mark S A Smith: Oh, yes. Oh, absolutely. I’m finding that too. I work primarily in the tech world, and the big brads are refusing to take advice. They’re so confused, but you’re right. We want to work with the disruptive folks. That’s why we do the Selling Disruption Show. Ted Rubin: Here’s my expression, and I’ll pass this to you. I prefer to get bored than to sell. Mark S A Smith: Yes, indeed. Mark S A Smith: My friends, that is the definition of marketing. Mark S A Smith: That is it. Ted, what should our listener do next? Buy your book? Connect with you? Watch your Chatter segment? All of the above? Ted Rubin: They should do whatever works for them. I’m really easy to find. Just Google Ted Rubin. I’m probably most of the first 10 pages, tedrubin@gmail.com. My phone number is 516-270-5511. I know everybody out there is afraid of the phone, so it’s easy to give out my number, but feel free to reach out some time. 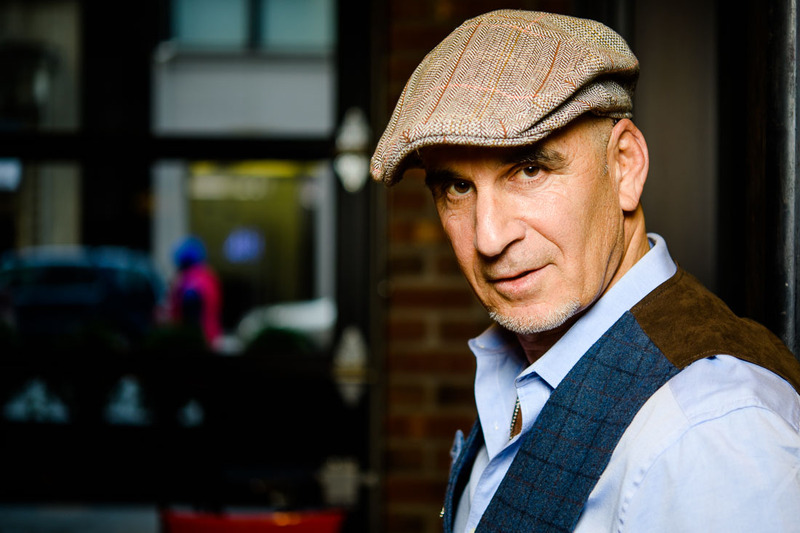 I’m @TedRubin on Twitter, Ted Rubin on Facebook. Connect with me. Reach out to me. I’m happy to engage. Just keep one thing in mind that I think is really the most important thing as we wrap up this session. 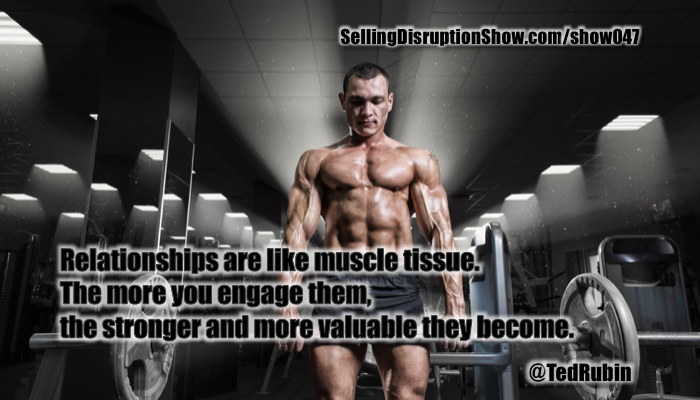 It’s that relationships are like muscle tissue. The more you engage them, the stronger and more valuable they become. Mark S A Smith: I love it. Thank you so much, Ted. Great to have this conversation with you. Ted Rubin: My pleasure. Thanks for reaching out, Mark.